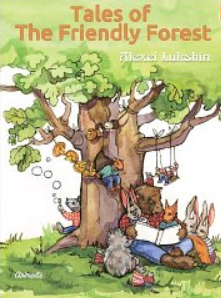 This kindle book is a collection of ten fairy tales told from the point of view of several animals living in the forest. At the outset the reader is introduced to a poem that tells of the song of the forest. The animals in the tales introduce themselves one verse at a time. In the beginning, the forest was in chaos. Each of the animals went about doing whatever he wanted. One day a clubfooted bear shouted out to the other animals of the forest from the top of a tree that from now on there would be a truce; all animals would be friends to one another and there would be no territorial boundaries. From that point on, all the animals of the forest had their own names, but they were all friends and helpers to each other. The rest of the stories focus on one or two animals who are able to teach the reader about compassion for others, the need to share knowledge, not to be afraid of the unknown, and to be true to oneself. In the story about fashion, the animals decide to be fashion mongers. Even though the boars delight in rolling around in the mud, they then rub against the trees ridding themselves of all dirt. The animals decide that boars are the neatest and cleanest animals in the forest. Appearances can be deceiving! In the story about the forest beasts watching children play hockey, children learn that TV and cinema did not always exist, there should be time for other pursuits. These short stories are intended for children and adults. The format is a bit unusual in that the book begins with a poem and then switches to verse. In a few places the flow is a bit choppy due to the translation. Still, I found the stories refreshing with good lessons for children and reminders for adults. The book can be broken up into sections for younger children and read independently by children eight and older. Makes a nice bedtime story book for children who love animals. If you enjoyed this post, please subscribe by clicking on the word Follow or by hitting the orange RSS feed button in the right hand corner at the top of this page.